Company launches new homepage more targeted to security and enterprise services. 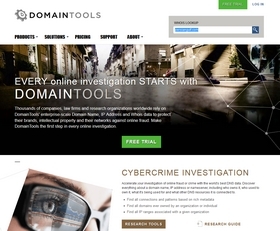 Don’t be alarmed if you visit DomainTools.com this afternoon and see the image to the right. The company, known in the domain name community for its whois and domain searching tools, has updated its home page as well as some other elements throughout the site. Some of the look and feel extends to other pages of the site, although the various tools are mostly untouched as of now. The biggest change facing power users right now will be a slightly different navigation to use each tool. You’ll notice that the tabs near the top of the page have been displaced by drop down menus. I guess a page has been turned. Good point. Most sites have a menu that drops down. Here the entire page pushes down. I’ll pass along the feedback.